An Iranian passenger plane skidded off the runway during its landing in northeast Iran and crashed, shredding the cockpit into a tangled mass of wreckage and killing 17 people, the state news agency said. Footage from Iran's Press TV showed the plane sitting at an angle, its tail awkwardly on the ground and the mangled front end pointing upward. The rest of the craft appeared largely intact. The IRNA news agency reported that the tires failed on landing and it skidded into a wall, though no wall was visible in the footage. 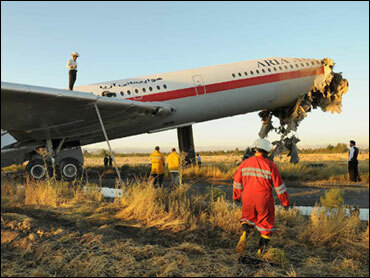 The Russian-made Ilyushin-62 plane from the privately owned Aria Airlines was carrying 153 passengers and flew from the capital Tehran to the northeastern city of Mashhad, 600 miles (1,000 kilometers) away. Local official Ghahrman Rashid told the state news agency that another 20 people were injured in the crash and that all survivors had been evacuated from the scene. He had originally given a slightly higher death toll and a lower figure for the injured. No reason was given for the change. The manager of Aria Airlines was killed in the crash, the state news agency reported. It was the latest in a string of deadly crashes in recent years that have highlighted Iran's difficulties in maintaining its aging fleet of planes. U.S. sanctions prevent Iran from updating its 30-year-old American aircraft and make it difficult to get European spare parts or planes as well. The country has come to rely on Russian aircraft, many of them Soviet-era planes that are harder to get parts for since the Soviet Union's fall. Iran's worst crash came in February 2003 and also involved a Russian-made Ilyushin that plowed into the mountains of southeastern Iran, killing 302 aboard - mostly members of the elite Revolutionary Guard. Some of the jets in Iran's fleet are U.S.-made craft bought before the 1979 Islamic Revolution, which led to a cut-off in ties between the nations. U.S. sanctions since prevent Iran from buying parts for those planes or new ones. In December 2005, 115 people were killed when a pre-1979 U.S.-made C-130 plane crashed into a 10-story building near Tehran's Mehrabad airport. The sanctions also bar sales of European jets with a certain amount of U.S. parts, limiting Iran's ability to buy from Europe. As a result, Iran has focused on Russian-built planes - like the Tupolev and Ilyushins, the Soviet-era workhorses for Russian civil air fleets. After the Soviet collapse, government funding sharply declined for manufacturers of aircraft and spare parts, and other countries using the planes have had a harder time getting parts.